Tucked away in the cold northeastern corner of England, the North Sea port city of Newcastle upon Tyne might not be the first name on every traveller's itinerary. However, the many historic buildings and bridges together with the recently revamped quayside area make Newcastle an interesting and atmospheric place to visit. The city is a former industrial powerhouse that saw massive decline in the 20th century but which is now reinventing itself as a centre for culture. And if that sounds dull, it’s also been dubbed the “party capital of Europe”! Founded by the Romans at a strategic crossing point on the River Tyne, Newcastle thrived for centuries, until the late 20th century saw the closure of the coal mines and shipyards on which its economy rested. But the city bounced back. Geordies, as the locals are called, are a resilient bunch. They are also among the friendliest people in the country, always ready to welcome and chat to a stranger - although their strong dialect may mean that their conversation is at times unintelligible even to fellow English speakers. Geordies love their football, perhaps more than any other set of fans in the country, so consider attending a match at St James’ Park - a great way to meet the locals. The main sights include the Norman castle that gave the city its name, and don’t miss a walk on the Quayside, with its famous seven bridges, including the iconic Tyne Bridge. The Millenium Bridge - Acclaimed worldwide for its physical and aesthetic beauty. Tilting times are announced regularly at the Gateshead Council website. The Tyne Bridge - A good example of a compression arch suspended-deck bridge famous the world over. 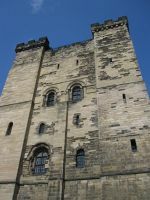 Newcastle Castle, The Black Gate, Castle Garth, ☎ +44 191 230-6300. Daily 10:00-17:00 (last admission 16:15). Remains of the Castle Keep and the surrounding castle garth, the "new castle" of the city's name. Parts of it were built by Henry II between 1168-1178. The original castle was built by the brother of William the Conqueror in 1067. Unfortunately some of the outer walls were removed to allow the railway through in the nineteenth century. Adults £6.50, concessions (students/seniors/unwaged) £5.50, children (5+ years) £3.90. Grey's Monument (At the Monument Metro station). Located at the heart of Grainger Town is a Grade I listed monument to Charles Grey, 2nd Earl Grey built in 1838. The wide base of the monument is a popular spot for people-watching, and often acts as a venue for buskers (most notably Apu with their Andean music), religious speakers and political activists/protesters. These days, unfortunately, people tend to crowd around the monument so much it is nigh impossible to view the plaques. Grainger Market - Traditional covered market with some historic shops including a very early branch of Marks & Spencer, dating back to 1895 when it was a Penny Bazaar – this is the world's smallest Marks and Spencer store. Entrances on Grainger St., Nun St., Clayton St., Nelson St.
Hancock Museum - Family-friendly museum with collections partially focused on north-east heritage, history and natural history, including an excellent display about Hadrian’s Wall, a number of Roman artefacts (including the gold Aemelia Ring, believed to be one of the earliest Christian artefacts found in Britain), a planetarium, Egyptian mummies (one of which is unwrapped), a tyrannosaurus rex skeleton, objects from a wide variety of world cultures (African tribal pieces, a burial effigy from Malekula, Japanese swords and armour and a Hawaiian feather cape and helmet) and artefacts from (mostly early) British history. Admission free apart from to the planetarium. , The museum is open Monday to Friday from 10am to 5pm, Saturdays 10:00am to 4:00pm and Sundays 11:00am to 4:00pm. It is fully accessible to wheelchair users (but check the website’s access information for the details before you go). And there’s a café on the first floor and plenty of nice grounds if you prefer to bring a packed lunch. The Baltic Centre - Gateshead Quays, South Shore Road, Gateshead (Right at the Gateshead Millenium Bridge, south side of the river), ☎ +44 191 478-1810, e-mail: info@balticmill.com. Daily 10:00-18:00 (except Tue 10:30-18.00); last admission 15 minutes before closing time. Constantly changing modern art exhibits are the hallmark of this gallery, located on the banks of the River Tyne in one of Gateshead's landmark industrial buildings. Admission is free. Also worth a visit to see the views of the river from the fifth floor viewing platform. Great North Run - The Great North Run is the world's biggest half marathon. It takes place every September, starting in Newcastle. The route crosses the Tyne Bridge to Gateshead and then runs east, parallel to the river, to finish on the coast at South Shields. Evolution Music Festival is held on the bank holiday weekend at the end of May. It is a weekend long music festival on the Newcastle/Gateshead Quayside, which boasts dozens of high end music stars from Dizzy Rascal to Iggy Pop. You can purchase tickets which cost around £35 for the full weekend, but you can also just go down to the Quayside and enjoy the music for free without getting close to the stage. Likely to be cold, even by English standards, however not as wet as the west coast. Summers are from June to August, when temperatures are around 20 °C. Frost and snow during winter are not uncommon, but mostly it is well above zero with some showers. Most of the precipitation falls during the autumn and winter months. Newcastle International Airport (NCL) handles both flights within United Kingdom and to several international destinations in Europe, Africa and North America. The airport can easily be reached from the Newcastle Central Railway station by a direct service and journey takes around 30 minutes. Rail: Airport station on the Tyne and Wear Metro is directly connected to the terminal through an indoor walkway. The station is the northern terminus of the green line with frequent, direct services to Newcastle (22 minutes) and Sunderland (55 minutes) city centres. Road: The Airport is connected to the A1 trunk road by the A696 dual carriageway. A regular bus service also runs from the airport to Newcastle and southeast Northumberland. A half-hourly service links the Airport to the nearby villages of Ponteland and Darras Hall, as well as Newcastle City Centre, on Monday to Saturday only, with the last journeys around 6:00pm. Service 74A operates a limited service to the city centre at other times. On the East Coast main line, direct train services link the city to London, York, Durham, Edinburgh and Aberdeen. Train fares, availability of seats, timings and onward connections can be checked at the official National Rail Enquiries website. The local rail network is operated by Northern Rail, with relatively frequent services to destinations such as Carlisle, Middlesbrough, Hexham and Morpeth. Cross Country Trains run every 30 minutes from Newcastle to Birmingham via Leeds/Doncaster, Sheffield and the East Midlands. Some services extend on to Reading and the South Coast, or through Bristol to South Wales or South West England. Cross Country also run north of Newcastle to Edinburgh, Glasgow and Aberdeen. Transpennine Express runs direct services from Newcastle to Leeds, Manchester and Manchester Airport. Newcastle upon Tyne is well signposted from the north, south and west. The city lies at the joining of the A1 (the main East Coast route from London to Edinburgh) and the A69 (a major east-west route to Carlisle and the M6). The A1 bypasses the city to the west. There are a number of 'park-and-ride' National Park and Ride Directory points around the city to avoid the hassle of parking in the city centre. From these points, the Metro or bus will take you into the city for between £1 and £3. Otherwise, there are over 10,000 spaces in the city centre, though for stays of more than a few hours this may prove expensive. Generally, parking in the city centre costs between £1 and £2 per hour, while parking about 10 minutes walk from the centre will set you back about £0.50 per hour. Direct bus services are available to London and across England with National Express and Megabus. Direct ferries to the Netherlands and to Scandinavia, including IJmuiden near Amsterdam and several places in Norway, like Bergen. DFDS Seaways between IJmuiden (Netherlands) and Newcastle. Quaylink services run every few minutes between the city centre and the Newcastle/Gateshead quayside. Single fares are £1.10p and the distinctive yellow livery makes the service easy to recognise. There are 2 bus stations in the city, Haymarket with services to the north of the city and Northumberland. Eldon Square Bus Station mainly serves Gateshead, County Durham and Teeside. An extensive and efficient network of bus routes radiate out of Newcastle into the surrounding towns and suburbs. Though the services are operated by several different operators they are coordinated by Nexus, Tyne and Wear's transport authority. Maps and timetables can be found on the Nexus website, though it may be easier to use a personalised journey planner such as Traveline. The Tyne & Wear Metro is a fast, safe and reasonably cheap way of getting around the city and also to outlying suburbs and surrounding towns including Whitley Bay, Tynemouth, North and South Shields, Sunderland and Newcastle International Airport. There are two lines: the Green Line runs from Newcastle Airport to South Hylton (in Sunderland) and the Yellow Line runs from St James Park to South Shields via a lengthy loop via the coastal towns of North Shields, Whitley Bay and Tynemouth. Note that the east-west and north-south sections of the Yellow Line cross at Monument Station, so if, for example, you are travelling from St James Park to South Shields, it is much quicker to transfer to the southbound Yellow Line at Monument rather than riding along the entire route. The Green Line shares tracks with the Yellow Line for the majority of the section through central Newcastle and Gateshead. Services run approximately every 6-10 minutes between 6:00 and 23:00. Single tickets range from £1.80 to £3.40 depending on the distance travelled, return fares and day passes are also available. The DaySaver allows for unlimited travel on one day and costs £2.70 (one zone), £3.70 (two zones) and £4.60 (all zones). Note that some ticket machines only accept coins (10p, 20p, 50p, £1 and £2) although change is given; most stations have been fitted with new ticket machines that accept notes and credit/debit cards. Although there are no ticket barriers at many stations and hopping (riding without paying) is widespread, it is advisable to keep your ticket handy as trains and stations are patrolled by ticket inspectors. Major stations have automatic ticket gates, but these may be left open at quiet times. Newcastle city centre is relatively compact and is therefore easy to navigate on foot. Many areas are pedestrianised. Being on the banks of the River Tyne, some areas slope quite steeply. Buses and taxis are fairly cheap and plentiful should this pose a problem. Newcastle is a reasonably cycle-friendly city. There are a number of places to lock a bike up in the city centre and cycle lanes exist (though these are often shared with buses or taxis). A few Metro stations also provide secure storage for bicycles, but note that only fold-away bicycles are permitted on Metro trains. Unless you're touring the UK on pedal power, the best use for a bike is to explore the Quayside, Ouseburn and Jesmond Dene areas, travel to out-of-town attractions or head off to more distant places such as Whitley Bay and Seaton Sluice on the coast. The Sustrans National Cycle Network Route 1 (East Coast) passes through Newcastle from the North to the South. There are places to eat in pretty much every street in Newcastle. If you are looking for something on a budget then you have several fast food restaurants around the city centre, while in the mid-range there are branches of most of the national chains and some great independents, including an especially popular Italian on Dean Street called Marco Polo. However, if you are looking for something a bit special, there's an excellent restaurant serving British food from the region in the ancient monks' dining room at Blackfriars, a great restaurant showcasing regional Italian cooking near the Quayside, Caffe Vivo and several gastropubs and other quality restaurants. And the city recently acquired its first Michelin-starred restaurant, the House of Tides, near the High Level Bridge. As everywhere, places do come and go, so although all the above are pretty well established, it's worth asking for up-to-date recommendations on the forum here too. Newcastle is (in)famous for its culture of social drinking, and is a popular destination for hen and stag parties, hence all the friendly-mad people dressed-up in fancy dress in the middle of Winter. No trip to the city would be complete with a night out on the Toon. The Bigg Market, the Quayside and, more recently, the Central Station area with its "Diamond Strip" of new upmarket bars, are the centres of nocturnal activity in Newcastle, though you'll find a wealth of bars and pubs all around the city. Popular clubs include Digital in Times Square, Liquid/Envy near Northumberland Street and Tiger Tiger in The Gate leisure complex. Newcastle is home to rather commercialised Newcastle Brown Ale, called by the locals Broon, Nukie or 'Dog'. There are a significant number of less well-known breweries producing real ale that is widely available and of good quality. Local brewers to look out for include Mordue, Wylam and Big Lamp. Newcastle has a wide range of accommodation options, from budget hostels to luxurious hotels and many midrange places in between. Sometimes breakfast is included and if not, there are many good options in town. As with the rest of the UK, European Union nationals have the right to work without a UK work permit, but most other nationalities require one. Newcastle's economy is buoyant at the moment and supports most types of businesses, so it is possible to find a job in a reasonably short period of time. There are a lot of call centres in and around Newcastle which provide an easy supply of short term work. It is seldom difficult to find employment in Newcastle's many pubs, clubs and bars. Newcastle University, ☎ +44 191 222-6000. One of the most important and respected universities in the UK and Europe, near the city centre. An easy walk from the Haymarket metro station, their small Museum of Antiquities is open to the public. Northumbria University, ☎ +44 191 232-6002. The Poly; with more of a focus on vocational courses such as fashion, design and IT, also near the city centre. It also incorporates Newcastle Business School. The Northumbria University Student Union is a popular venue for visiting bands. Newcastle College, ☎ +44 191 200-4000. A large campus, located on Rye Hill in the Elswick area west of the city centre. It features purpose built facilities for engineering, sport, performing arts, food and leisure, science as well as various A level courses. I have lived in the north east of England including newcastle for 5 years and have explored extensively through Geocaching. This is version 47. Last edited at 8:29 on Nov 20, 17 by Utrecht. 33 articles link to this page.